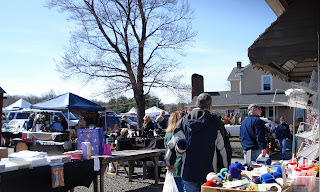 Well, I heard the forecast for today to be a beautiful one so I baked like crazy all day yesterday to be able to set up at Rice's Market in New Hope today. I had never sold my treats at this market before but have been shopping there for years. It's a fun market to shop. with a variety of goods for sale from antiques and collectibles to plants and jewelry to, of course, baked goodies! Since I didn't know what to expect I just baked my best sellers and I have to say I was pleased with the sales. 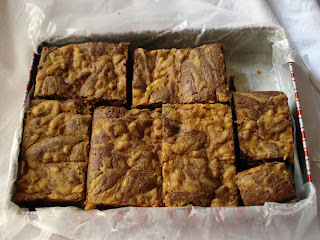 Everyone loved the cookies, brownies and blondies, from the samples I put out so that was great! But after getting up at 5 AM, packing the car, setting up, selling outside for hours and then packing up again...I'm so tired I can barely type any more... so til next time!! Can you ever guess from the photo what I sell?! As I stated in an earlier post, my cookie company is just a year old and for the past year I have been researching, baking, experimenting, baking, buying chocolate chip cookie cookbooks, baking, trying every chocolate chip cookie from every local bakery and ...did I mention BAKING!? 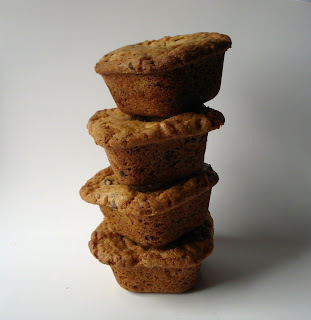 for the chocolate chip cookie that I would be proud to represent my cookie company! 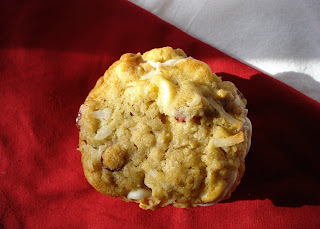 I really have gone crazy, recipe and taste testing this cookie and today was yet another experiment day. I somehow came across a recipe named "Best Damn Chocolate Chip Cookies, Ever" and I gave it a try. The photos show the results, which I am happy to announce, are very good. The original recipe calls for dark brown sugar. I felt the end result made the cookie too dark, almost chocolatey colored so I remade the recipe using light brown sugar and the coloring was much more like you'd expect to see a chocolate chip cookie to be. The first photo shows the dark brown sugar cookie and the second photo shows the light brown sugar cookie. To me the taste was no different. So, you may ask, have I found a "best" chocolate chip cookie?..Who knows what tomorrow may bring! Happy baking! 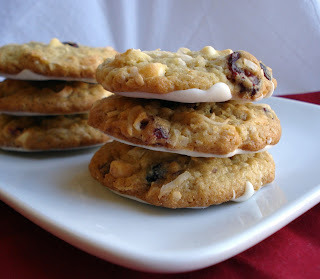 I wish you could just reach into your computer screen and grab a bite of this cookie...it's so good! I have actually had customers call me to tell me how much they love the taste. 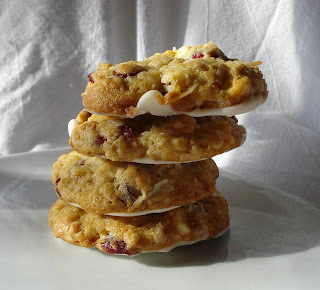 The white chocolate chips and tart dried cranberries are a great combo. They also have coconut and oatmeal and the bottoms are dipped in white chocolate. When the weather gets warmer though it may not be a good idea to dip them. They are for sale on my web site www.buckscountycookie.com and in my etsy shop, user name buckscountycookie. What is that blob you ask ? 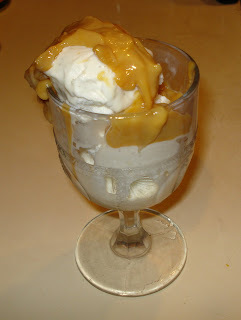 Why it's dulce de leche, of course!! 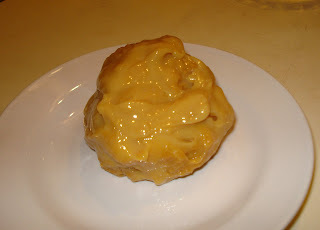 I made the dulce de leche using the oven method last night according to the inside label from the can and it worked out great. No worrying about scraping it off the ceiling when using the stove top method ! 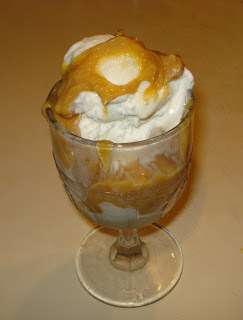 Then I put it into a glass and refridgerated it to use later...like tonight warmed and poured over vanilla ice cream. It's so very good. Try it sometime. It's very easy to make. I had to be in Doylestown this afternoon and since it was such a beautiful day here today I brought my camera along just in case I was inspired ( well yes, I'm always inspired to photograph something!) You know, sometimes when you live in an area that has so much to offer and you see these wonderful places every day you tend to take it for granted and don't really appreciate the scenery as a visitor would. 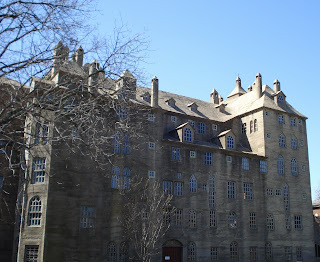 So, I "visited" Doylestown today, with camera in hand and bring you photos of the Mercer Museum which is a truly amazing structure. 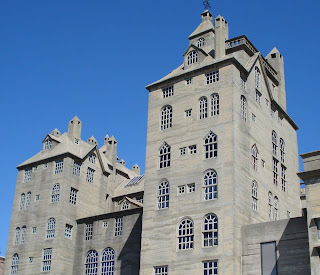 This is a six-story, concrete castle completed in 1916 to house Henry Mercer's vast collection of early American everyday objects. If you ever get a chance to visit, you will be amazed with the treasures on each floor. 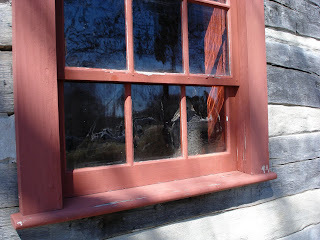 There is a log cabin also on the property which I show a close up of the window. Okay now, I really need to get back in the kitchen to do some baking ! When my son Kris was home from college a few weeks ago for Spring break he reminded me I hadn't made him pierogies in a while. I took that as Mom...how about it?? So today was pierogie day. It's a bit labor intensive but, hey, he's worth it and I, of course, had to sample a few for dinner, right? Mom has to eat, too! So I got out my favorite recipe and proceeded to measure,stir,roll and stuff the little pot stickers, as they are also sometimes called. This recipe is very good. The dough is made with lots of sour cream, I'm thinking that's an authentic Polish ingredient to add to the dough? How many this recipe makes depends on the size you make. I make mine kind of large and it makes about 3 dozen. In a large bowl, stir flour and salt. Set aside. In a separate bowl,whisk butter,sour cream,eggs,yolk and oil. Stir the wet ingredients into the flour/salt mixture til well blended. ( Don't worry if it seems a little lumpy. It rolls out smooth). Cover bowl with towel and let it rest about 20 minutes. Cook potatoes til tender. Drain and mash with cheese. Season with salt & pepper. Separate dough into 2 balls. I usually divide again to work with smaller portions of dough. After you have all the circles cut out you can roll them individually to get them even thinner. Place about 1 tbsp. of filling on one side and fold dough over so edges meet. With a fork dipped in flour, press the edges to seal. Trim away any excess dough if there seems to be too much and repress with fork. Place pierogies in a single layer on a cookie sheet covered with waxed paper and put into freezer til frozen. Transfer when frozen hard to zip lock bags. When you want to use, just put frozen pierogies into pot with lots of boiling water and gently boil til they float. Then fry in pan with butter. We like them with sauted onions and more sour cream. ( Ran out of sour cream for the photo...darn!). I have made shortbread cookies with Earl Grey Tea before so I thought it would be interesting to try a new tea flavor. I chose Constant Comment because I love the hint of orange. And because orange and chocolate is an unbeatable combo..putting the two flavors together was a winner! It still needs some "tweeking", but the basic idea is there. They look pretty, too. Don't you think? 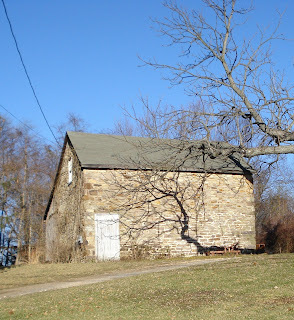 I am so fortunate to live in a beautiful area of Bucks County Penna. I even named my cookie company after it !! I took a day off from baking today and my friend and I went out for a drive in the country. 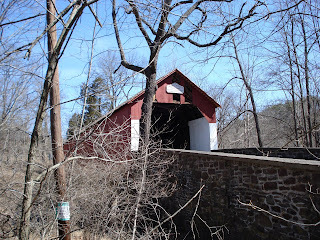 There are just roads galore of scenic places to see and photograph around here in Bucks Co. and I will continue to share many of them with you. 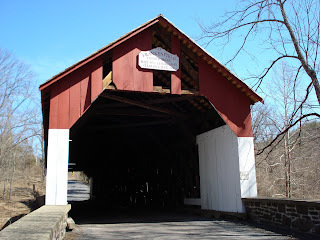 Barns, stone farmhouses, farms and of course, my favorite, covered bridges everywhere! Well, enough talk...just look and delight in the beauty!! To celebrate the first day of Spring, I just had to photograph flowers! 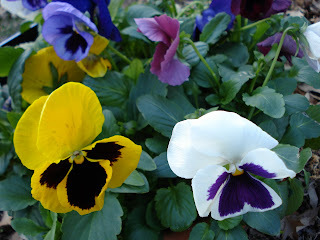 Pansies are such cute and happy little flowers... and okay, that's the only bunch of flowers I could find today !! They look like little faces.. Don't you think? 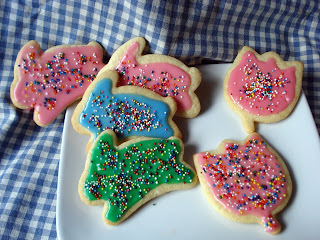 I also thought the first day of Spring would be a fun time to bake some cutout cookies so I whipped up a batch of sugar cookies and decided to decorate them with colored icing. Little bunnies and tulips. I didn't use royal icing so the icing is still drying ..and that was hours ago!! Maybe they'll be ready in time for breakfast! When is a brownie no longer considered a bar?? 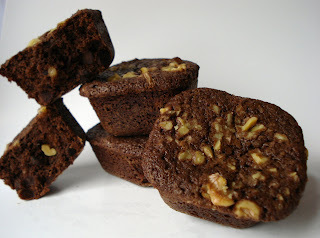 When it's morphed into a square brownie bite ( or rather 2 to 4 bites!). I decided I liked the idea of baking my blondies and brownies individually so I found a square muffin pan and experimented. I think it works! Any thoughts would be greatly appreciated!! Well it has been a little over a year that I made the decision to start my cookie business and in some ways the year seems like a very long time and in other ways it seems like the year went by in a flash! I have been trying to begin my entries on this blog for forever !! but keep getting side tracked...but today as my 1st yr. anniversary approaches I figured, what the heck, just do it!! 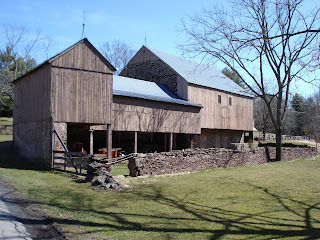 So, having said that, let me say that my goal is to record my journey in the business, take photos of , I hope, interesting and informative "goings on" in my area of Bucks Co., PA and post recipes...Yikes...all that takes time, doesn't it? Well, not to start on a negative note but I am constantly trying out new recipes for everything related to my business and this latest one is no exception. 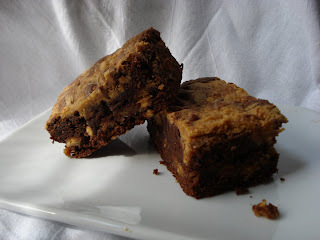 As you see, part of the title of today's blog is trial and error and the peanut butter brownie recipe I made looks great but the taste isn't chocolatey enough for me. I got it out of an old issue of Martha's mag. I am constantly trying new ideas and new ways to make a great product as I refuse to sell anything that doesn't meet with my approval. This one doesn't...so off they went to my son and his roommates in college. The darned things weighed a ton to ship, too !